At Compusult, we believe in equal opportunities, and believe in providing adaptive solutions to those individuals with various disabilities. Our assistive technology products offer individuals the ability to more actively and effectively participate in work and social situations. Go directly to our catalog featuring Compusult products and other third party manufacturers. Download this document to guide your AT requests and purchases. 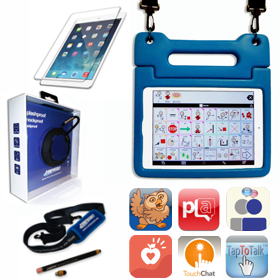 A high-quality portable AAC bundled solution that can be customized to include an iPad or select Android device, pre-installed with various AAC software, as well as accessories such as an EVA2 protective case, tempered glass screen protector, carrying strap, ergonomic metal stylus and the iGo Bluetooth wireless portable speaker.